Bomb sites seemed 'ordinary' : click on image to open a larger version in a new window. I was not born until three years after World War II but I can remember how the war had clearly had long term effects on many people who lived in Brighton. Looking back, I was too young to realise that these effects were a result of the war. To me, they were just ordinary people. Just as bomb sites were simply part of the town. One of our teachers at The Down’s Primary School, would have bouts of terrible shaking and an awful temper. It was only later that it was surmised that this was a result of wartime experiences. Later, a Fawcett School, one or two of the teachers had terrible tremors and would break out in sweats at different times of the day. One had a nervous twitch that affected his mouth and tongue. Some say he was sadly nicknamed ‘the flycatcher’ but I don’t remember hearing that. Like many teachers at the school, he had a awful temper. He often said, ‘we won’t do any maths today. Ask me some questions’. At one point, he said, ‘ask me some questions about places that I have been to’. Perhaps talking about previous years and other places was cathartic for him. Or perhaps he was just fed up with teaching maths. I suspect that quite a few men went into teaching because the war had created a gap in their CVs or because they missed military discipline. It was very common to see men who had had legs amputated. They walked around on wooden, under-the-arm crutches. They often had the trouser leg, on the amputation side, folded and pinned up to just below knee level. I presume that access to prosthetic limbs was not readily available. Those who had suffered eye damage, or perhaps blindness in one eye, often work either pink or black eye patches. Some people had clearly lost sight in both eyes, wore very dark glasses and were often accompanied by a second man who led them along, arm in arm. There were one or two blind match sellers in the town. I first heard of the term ‘plastic surgery’ after I had seen a conductor on the 26 bus with great disfigurement of his face. My mother told me that he had had plastic surgery, to improve the look of his face. I did not then, know what the term meant and carried on believing that ‘plastic’ was involved. As I child, I used to think that he was very brave to take on such a public job. It might be thought of as a patronising sentiment now, but as a child I think it was a way of coping with an unusual situation. I was born in 1943 in London and moved to Brighton with my parents in 1944 to Bennett Road. 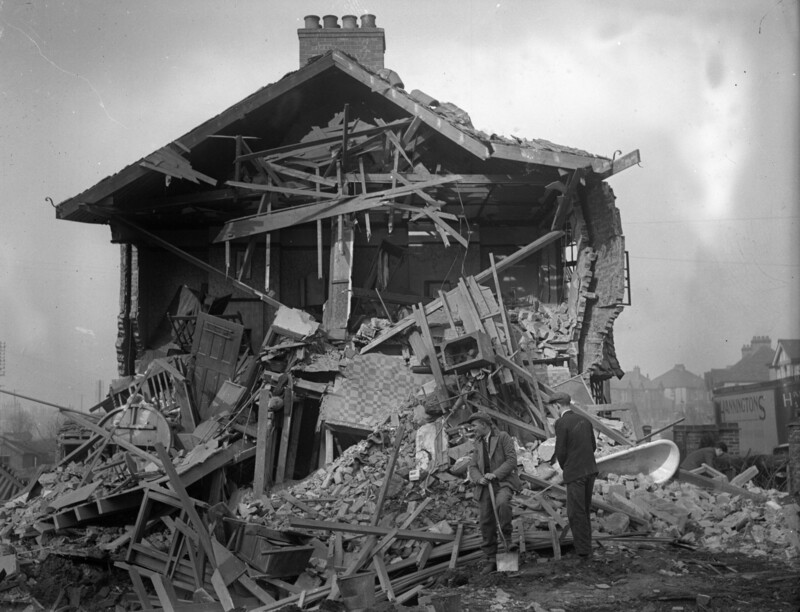 I well remember the bombsites in Brighton and also when we visited London. There was a bombsite in Bennett Road where five houses were taken out. We kids played for hours on this bombsite which was adjacent to Mr. Perry’s orchard, so a little more of an attraction. As a kid and as a young man I also remember the men walking around with horrific burn scars on their faces obviously from the war. A lot of them worked on the buses as conductors and drivers. I remember one man had a three inch by two inch burn scar on his forehead. Years later I found out how these brave men got their wounds. We have a lot to thank the men and women for their struggle during those days. I well remember the many one-legged ex-servicemen with their crutches and pinned-up trousers around the Kemp Town area after the War. St Dunstans was at the old Portland House in Chesham Road and so there were many blind ex-servicemen about as well with their white sticks. At Fitzherbert we had a teacher who was an ex RAF Squadron Leader, Sqdn Ldr Liddell who had a bit of a speech impediment, sort of stutter or cough. He was CO of our ATC and said to be a War Hero but as I do not know his first names I have never been able to find out anything about him.